William Hope Harvey was a wealthy, influential businessman at the end of the 19th century. He was active in national politics from the election of 1896 to his race for president in 1932. He must have been the 'Ross Perot' of his day. He was the presidential candidate of the Liberty Party in the election of 1932 and the party's national convention was held at his resort in Monte Ne, Arkansas. I have read that the delegates held their meetings in the amphitheater so the party must have been pretty small since the amphitheater will hold 1000 at most. Actually it didn't even look that big to me. Harvey obtained his wealth from silver mining in Colorado and was a strong supporter of the free coinage of silver. He wrote several books promoting his views on politics and finances and his views apparently are still studied today. One of the books featured a brilliant young boy named Coin, and from then on, Harvey's nickname was Coin. By the time Coin Harvey built the 'pyramid' amphitheater, obtaining financing for this type of project was increasingly difficult and businessmen didn't have things like 401k business financing or other types of lending support until long after his lifetime. 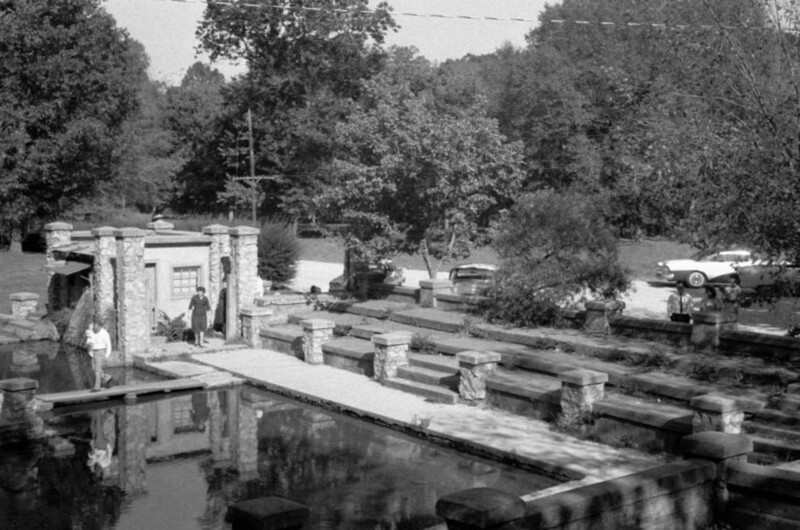 Harvey developed the resort at Monte Ne during the first two decades of the 20th century in the Ozark hills in the White River valley a few miles east of Rogers. 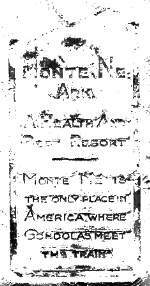 He had a railroad built to connect his resort with Rogers and advertised that Monte Ne was "A HEALTH AND REST RESORT . . . 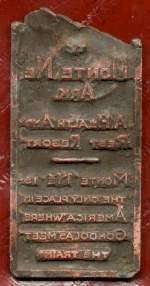 THE ONLY PLACE IN AMERICA WHERE GONDOLAS MEET THE TRAINS" as stated on this old printing plate from the Peternells's collection. 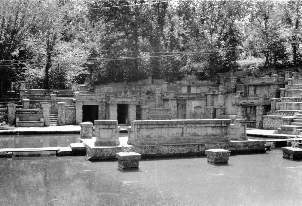 Harvey began work on the resort at Monte Ne about 1901. The Bank Block (see photo on next page) was built in 1905. A long lagoon ran from the resort hotel to the amphitheater and guests were transported along the lagoon by an Italian gondola. Harvey wrote and published a book "The Remedy" in 1915. He apparently thought that civilization was as bad then as we think it is today. His 'remedy' was instruction in Character Building. "The Remedy" included a pupil's lesson book on character and Contribution Blanks for those who wanted to support an educational movement to promote the teaching of character. Blank A was a promise to contribute a given amount to the cause when at least $250,000 had been subscribed. The blank cautions that "Those signing contribution blanks, will please write their names and addresses plainly . . ." and ". . . address all communications to, Wm. H. Harvey, Monte Ne, Ark." Blank B was the form used when a contribution was actually made and it was to be sent to the Farmers' State Bank of Rogers. Seven of the Blank A's and three Blank B's were included. An ad in the back said "Agents Wanted to sell this book." Another offered a "Special Price" to those who wanted to give them away. The little student booklet was also printed separately and a price list for them was included. Finally, Harvey recommended two books: "Pollyanna" by Eleanor H. Porter and "The Eyes of the World by Harold Bell Wright. It was not my intention to review the book, but there is an interesting prediction of what the world might be like in 1935, ten years after the book was written. Harvey died in 1936. Harvey believed that civilization would be destroyed and his goal was to place a time capsule in the base of a tall obelisk (commonly called 'the pyramid') that would include items that would show the technological state of civilization at that time and writings giving his opinion of what would have caused civilization's failure. He thought that earthquakes and volcanic eruptions would eventual bury the pyramid, so he was going to put a plaque on the top that would direct future explorers to dig to its base to find the time capsule. He never built the obelisk, but in the 1960s his resort WAS buried, not by rocks and lava, but by the waters of Beaver Lake. I was at the University of Arkansas in the early 60's and news about the work on the White River dam that produced Beaver Lake created a flurry of interest in Monte Ne. There were rumors that Harvey had actually buried the time capsule even though he never built the pyramid. A group tried to persuade officials to search for the time capsule before the area was flooded and a group even assembled in the amphitheater expecting something to happen. Some official told everyone to leave because there was nothing to look for and no one was going to try. The B&W photographs here were taken in 1961 or 1962. All but one of the color slides were taken after the site was flooded; some when the lake level was high and others when it was low enough to expose the upper levels of the amphitheater. 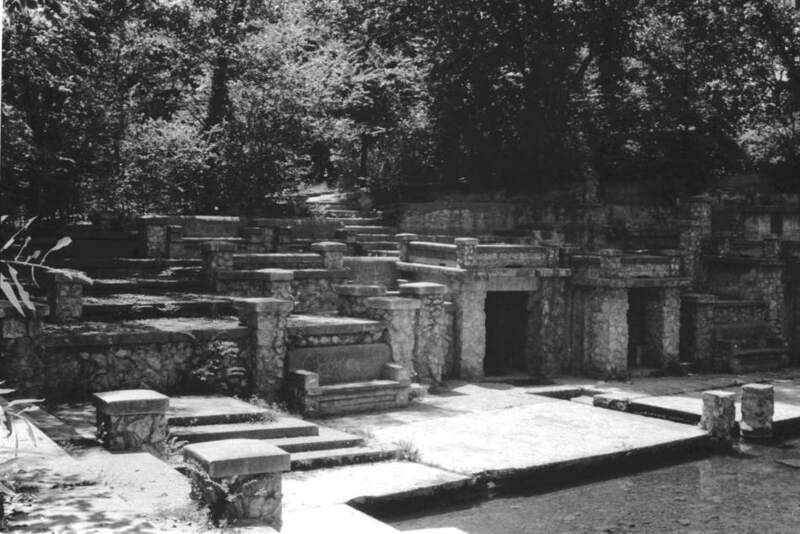 The entrance, podium, and stairs up the high side of the Monte Ne Amphitheater. The three B&W images above show the amphitheatre entrance (right photo), the podium, and the high side as they were in 1961. The resort lodge was located at the other end of the lagoon. Guests were brought from the lodge to the amphitheater by gondola for entertainment and programs. They disembarked at the dock behind and to the right of the podium and entered through the small bus-stop looking building. Click underlined words for large individual images. The amphitheater was probably not constructed until the late 20s. I have read that Harvey intended the amphitheater to be the entrance to his proposed 'pyramid' or obilisk. 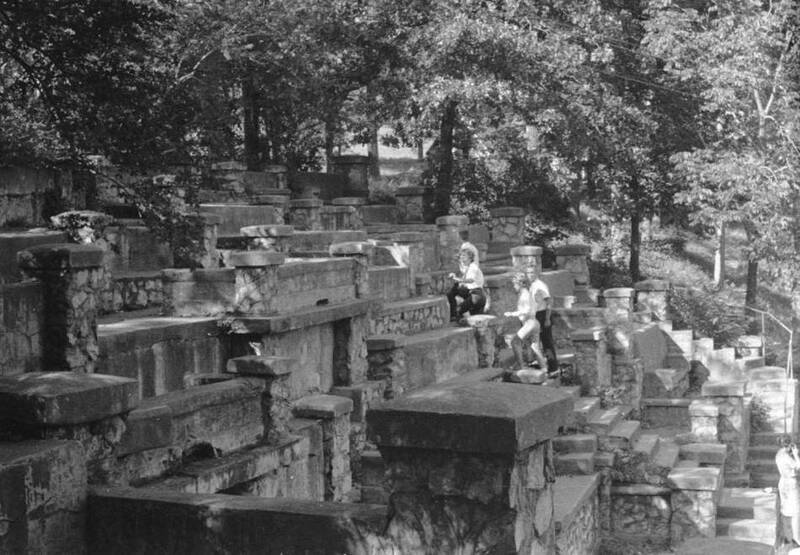 The journal of a young woman who visited Monte Ne in 1926 did not mention the amphitheater. However, Harvey's Liberty party held its presidential convention at the amphitheater in 1932. The amphitheatre was underwater by 1966, but as the level of Beaver Lake varied of the years, parts or all of the amphitheater was exposed to the light of day. In 1977, the lake level reportedly fell to 1092 feet above sea level. This is approximately the level at which Harvey maintained his lagoon, so all the amphitheater was revealed. However, in July of 1977, when I took some of the later photos, the lake was at approximately 1107 feet above sea level, so only about the upper eight feet of the high side was above water. In the 1980s the water again dropped to about 1105 foot level. 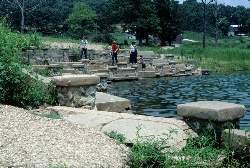 Thus the current drop in the level of Beaver Lake (2005/2006) has revealed the amphitheater to a new generation of visitors. 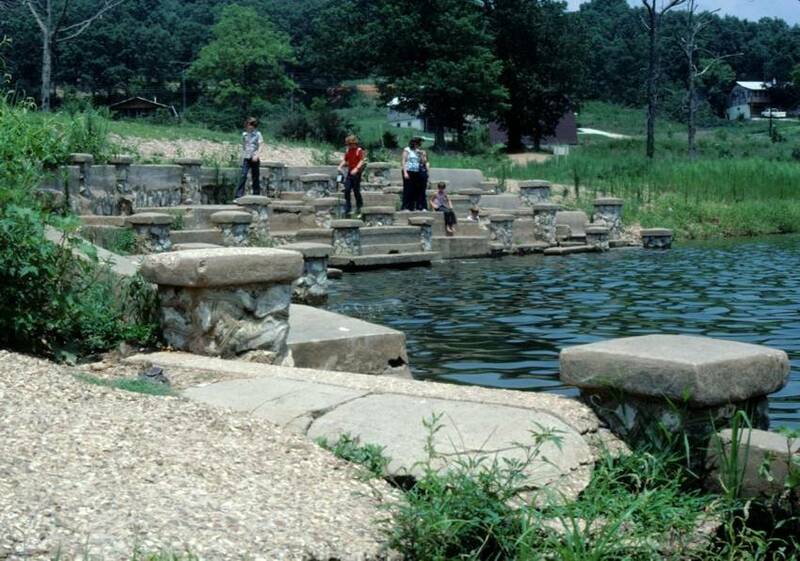 This low water level period is the first during which people have been able to search the web to find online photos and articles about Coin Harvey, Monte Ne, the amphitheater, and his lost resort. This color photo was taken in July 1977. The water level is about waist level of the woman in black slacks climbing the stairs in the 1961 photo above. Coin Harvey bought several hundred acres of this area around 1901 to 1903 and started building his resort. There were many springs feeding streams that formed tributaries of the White River. 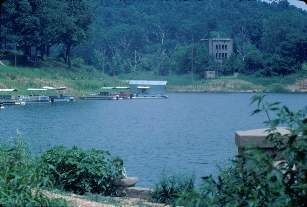 Harvey had a series of small dams and channels built to fill a series of lagoons to connect the various lodges and features of Monte Ne. This old postcard shows the Commercial League Band posing on the boardwalk around the "Big Spring" at Monte Ne in 1910. 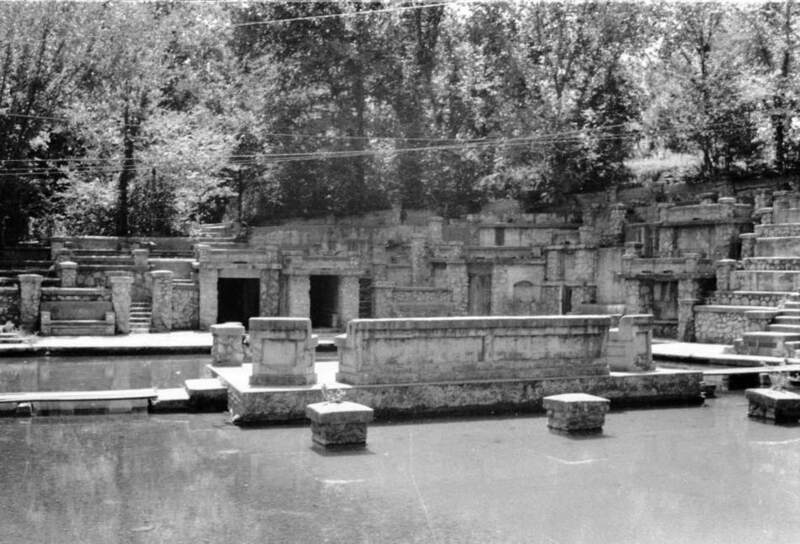 The amphitheater was built around that same Big Spring about twenty years later. The postcard photo shows a cut-out in the boardwalk that is very similar to the cut-out in the concrete walkway around the bottom of the amphitheater. I have read an article from 1908 or 1910 in which a young man explained that he arrived at Monte Ne in the area of the Big Spring. While other passengers took the Swan Boat to Oklahoma Row, he walked around the Big Spring and on up to Oklahoma Row. The rail line from Lowell to Monte Ne apparently was abandoned in 1910. By 1914, Harvey was involved in the 'good roads' program in an effort to make it easier for tourists to reach Monte Ne by automobile. His interest in roads was not limited to the area near his resort. The group he was involved in managed to identify and improve roads in southwest Missouri and across Oklahoma, the Texas panhandle, and on into New Mexico. Much of that route was adopted for the famed Route 66 Mother Road in the late 20s. The image on the left shows the end of the amphitheater viewed across the podium. The next photo shows the interior of one of the small cellar-like rooms in the wall of the amphitheater. Some thought that the time capsule was buried behind the walls of one of these compartments. Here are old and new views of the Oklahoma Row Tower across the lake from the area of the large wall behind (south of) the amphitheater. This part of the lake is the area that used to be the lagoon. There were other branches of the lagoon in the old days. The tower was originally the south end of Oklahoma Row. A small block structure was near the base of the tower in 1977 and now there is only a pile of rubble at that location. The next page has an old post card showing how the Oklahoma Row log building and the concrete tower looked back in 1910. PAGE 1 - The story of Coin Harvey and Monte Ne with photos of the amphitheater. PAGE 5 - Lissa Myer's Current photos of the ruins at Monte Ne: the Tower Windows, old foundations, and crowds at the amphitheater. PAGE 6 - 2005 Views of Oklahoma Row foundation and tower with a new summary of the events of William Hope "Coin" Harvey's involvement with his Monte Ne Resort and the good roads movement. This page includes many links to other informative web sites related to Coin Harvey and Monte Ne. PAGE 7 - Photo and map of the old townsite with a panoramic photo of some of the foundation ruins on the lake shore and across the lake to the amphitheater. There is a photo that shows the new location of Harvey's tomb. The text includes some comments from a U.S. Corps of Engineers employee who toured the Monte Ne site for the Corps in the early 60s. 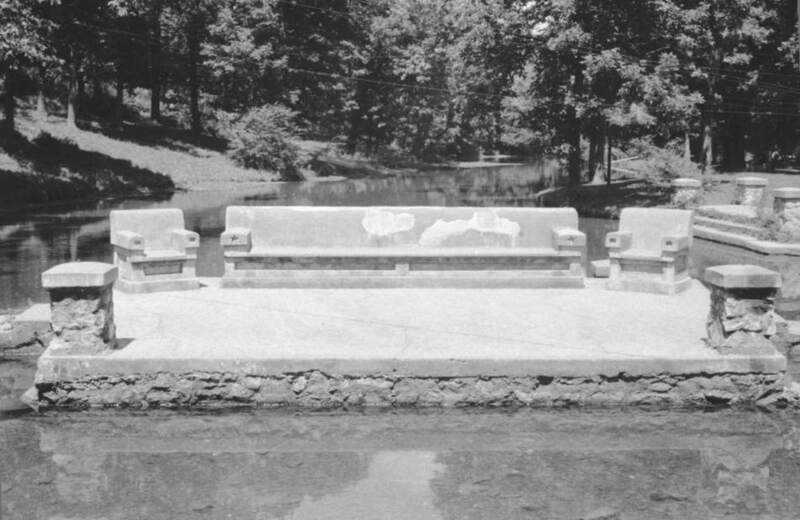 PAGE 8 - Coin Harvey's Amphitheater around the Big Spring at Monte Ne. Harvey planned this to be the foyer for his pyramid or obelisk in which he planned to place a"time capsule" or museum room to hold all the important documents and marvels of civilization. However, that was never to be because he was unable to obtain financing. The photos on this page show the upper parts of the amphitheater now exposed by the dropping waters of Beaver Lake. Old photos from before the lake was built and at other times when the lake was low are included for comparison. PAGE 9 - This page continues the amphitheater description with the south wall. Most of the south wall is under water even with the lake level at 1106 feet above sea level. The south wall may have been the planned entrance to the pyramid and time capsule that Coin Harvey wanted to build. In any case, he probably planned to build the pyramid, or obelisk, on the little hill behind the amphitheater. That little hill is an island when the lake level gets to the 1120 to 1125 range as shown in the photo posted on the previous page. PAGE 10 - On the side of the hill behind the south wall is a tall retaining wall. The area was so covered in brush in 1961 and I was so hesitant about the possibility of trespassing that I didn't find that wall. There is a paved driveway leading from the east of the amphitheater up to the area above the wall where the railroad depot used to be. There are also panoramice photos of the view from the amphitheater back toward the old Monte Ne town site. PAGE 11 - Selected Monte Ne Resort photos from the Rogers Historical Museum used by permission. 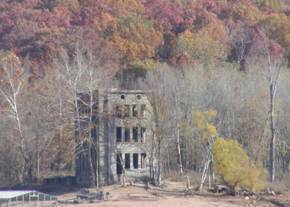 Photo of old Monte Ne in great detail. Photos of the Bank Block when new and years later after it had been gutted by fire or weather. Photos of the amphitheater from its unfinished construction in 1928 and when that part of Beaver Lake was dry in the winter of 1977. PAGE 12 - 2006 Wedding in the Monte Ne amphitheater. First wedding there in more than 40 years? Photo of Ann in the amphitheater in 2006 compared to a similar photo from 1977. PAGE 13 - Photos comparing the low lake level in January 2006 with the same areas in January 2007 after the lake level rose about 20 feet. 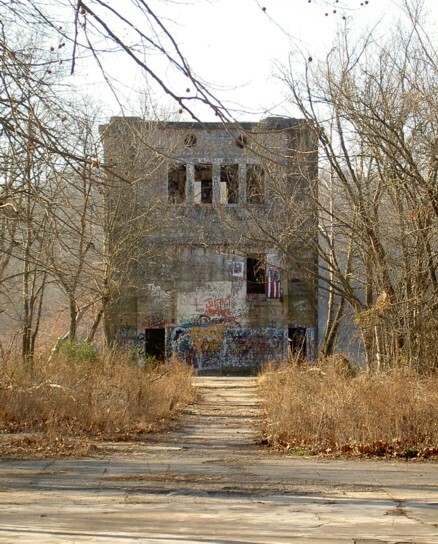 Can the Friends of Monte Ne be reorganized now that there is such great interest in the lost resort? With proper organization, planning, and fund raising, some nice things could be done in the area by the Lake at old Monte Ne. The old Oklahoma Row foundation and adjoining area could be cleared and made into a picnic area. A 1/10th-scale model of Harvey's proposed "pyramid" could be built near the Oklahoma Row tower. The tower could be restored and a log entry room could be built where the Oklahoma Row used to connect to the tower. The room could serve as the entry to the tower and as a museum and gift shop. It would help to have someone with connections to the local district of the Army Corps of Engineers, the State Parks Department, and maybe some of the local politicians. If you're interested, e-mail me at jamesmskipper1141@att.net and I will pass it on to the interested people who live in the area. 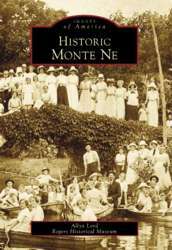 For a definitive picture album/history of the resort at Monte Ne, purchase Allyn Lord's - Historic Monte Ne published by Arcadia Publishing in its Images of America series.